Built approximately 12 years ago, October Cottage is a four bedroom detached property located in the quiet village of Quarrington, Lincolnshire. This property is a uniquely designed home with plenty of charm and potential, boasting a large entrance porch and hallway, a welcoming lounge with original features as well as a private garden that isn’t overlooked. Realising its potential, the homeowner aimed to improve the property with the addition of an extension to the rear. 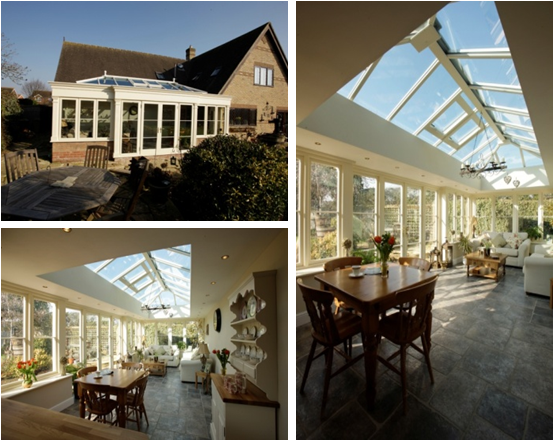 Wanting more than a conservatory, an orangery was chosen as an ideal solution. Made predominately from glass, the orangery would create a light and airy space that would allow for the kitchen to become more open plan – providing a family living space that would not only be stylish but in-keeping with the cottage. Favoured mainly for design, build quality and value for money, approximately £70,000 was invested on a bespoke orangery with a lantern roof from Charles Christianson. Pilkington Activ™, a glazing solution with self-cleaning glass properties, was chosen to help complete the orangery, as keeping maintenance low was a key consideration for Mark Garwood. Pilkington Activ™ uses a unique dual-action coating that utilises daylight and rainwater to break down and wash away organic dirt from exterior surfaces, making it ideal for hard to reach places that are difficult to clean – keeping maintenance at a minimum. Combined with a inner pane of Pilkington low-emissivity K Glass™, this glazing solution reduces the amount of heat lost through the windows – improving energy efficiency but also helping stabilise temperature through hot summers and cold winters. To learn more about Pilkington Activ™ please visit our product pages.